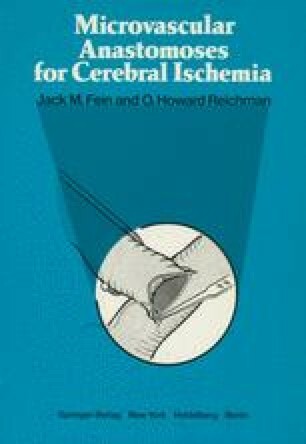 With the advent of microsurgical techniques, extra- to intracranial arterial anastomosis has become technically feasible for the treatment of inoperable or inaccessible intra- or subcranial occlusive cerebrovascular disease. (1) Patency rates for end-to-side superficial temporal to middle cerebral artery anastomosis are acceptable at 90%, morbidity rates are 2%, and collateral augmentation has been documented angiographically as well as with clinical and experimental cerebral blood flow studies. (2,4,6,7,11,12) The value of such procedures for preventing completed stroke in patients suffering transient ischemic attacks will be demonstrated only when a large randomized study has been performed. Previous work in our laboratory has shown that a cortical branch of the middle cerebral artery at least 1 mm in diameter could be found under a 4-cm craniectomy centered 6 cm above the external auditory meatus, in 90% of 50 brains dissected. (5) The purpose of the current study was to determine if the occipital artery could be used for anastomosis, with suitable cerebellar or cerebral cortical branches, in patients with vertebrobasilar occlusive disease.